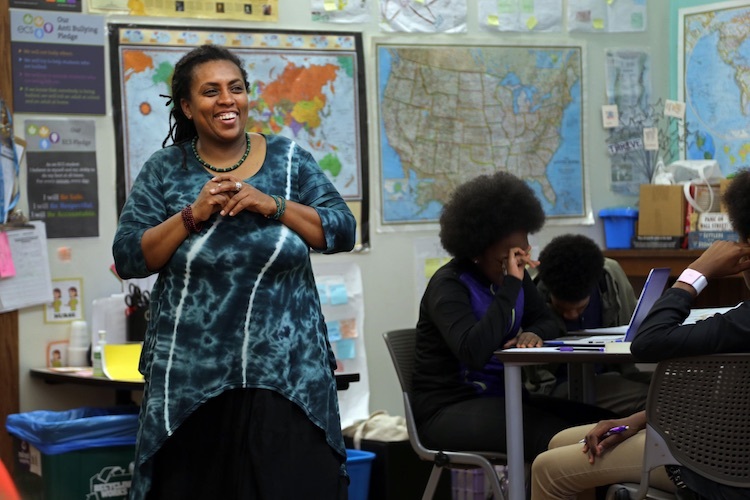 When educator Michelle King teaches middle school students about America’s founding document, she kicks off the lesson by asking how people today break up with each other. A simple electronic text or sending a proxy to deliver the news are suggested by the eighth-grade students. Making learning fun and relevant by making it connect to their own lives is how King inspires learners. It’s what makes her the learning instigator. Another example of her innovative teaching is the game she co-created called “Thrive.” The only way to win is to cooperate and coexist while learning about cultural literacy and social justice. It’s designed for movement, King explains. In one version of the game, students choose to represent a European nation or a Native American nation and must record histories and trade and share knowledge about different cultures in the quest for peace while building on the joy of learning. King will share more as she delivers the featured plenary Aug. 2 at the Connected Learning Summit at MIT. Meanwhile, check her out in this Tedx talk as she discusses education and remaking learning.